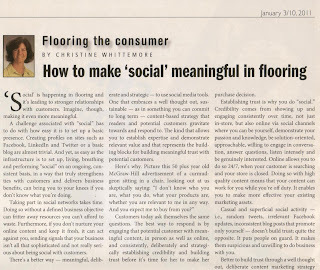 Here follows my article titled "How to make 'social' meaningful in flooring" from the January 3/10, 2011 issue of Floor Covering Weekly. 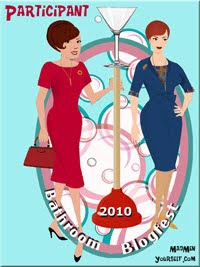 A challenge associated with ‘social’ has to do with how easy it is to set up a basic presence. Creating profiles on Facebook, LinkedIn and Twitter or a basic blog are almost trivial. And yet, as easy as the infrastructure is to set up, living, breathing and performing ‘social’ on an ongoing, consistent basis, in a way that truly strengthens ties with customers and delivers business benefits, can bring you to your knees if you don’t know what you’re doing. The reality is that taking part in social networks takes time. Doing so without a defined business objective can fritter away resources you can’t afford to waste. Furthermore, if you don’t nurture your online content and keep it fresh, it can act against you, sending signals that your business isn’t all that sophisticated and not really serious about being social with customers. There’s a better way – meaningful, deliberate and strategic – to use social media tools. One that embraces a well-thought out, sustainable – as in something you can commit to long term – content based strategy that readers and potential customers gravitate towards and respond to. The kind that allows you to establish expertise and demonstrate relevant value, and represents the building blocks for building meaningful trust with potential customers. Picture this 50+ year old McGraw-Hill advertisement of acurmudgeon sitting in a chair, looking out at us skeptically saying: I don’tknow who you are, what you do, what your products are, whether you are relevantto me in any way. And you expect me to buy from you? Customers today ask themselves the same questions. The best way to respond is by engaging that potential customer with meaningful content, in person as well as online, and consistently, deliberately and strategically establishing credibility and building trust BEFORE it’s time for her to make her purchase decision. Establishing trust is why you do ‘social’. Credibility comes from showing up and engaging consistently over time, not just in-store, but also online via social channels where you can be yourself, demonstrate your passion and knowledge, be solution-oriented, approachable, willing to engage in conversation, answer questions, listen intensely and be genuinely interested. Online allows you do to so 24/7, when your customer is searching and your store is closed. Doing so with high quality content means that your content can work for you while you’re off duty. It ensures that the last person a customer interacts with isn’t always ‘at the bottom’ to quote Tom Jennings in his 9/6-13/10 column. It enables you to make more effective your existing marketing assets. Casual and superficial social activity – i.e., random tweets, irrelevant Facebook updates, inconsistent blog posts that promote only yourself – doesn’t build trust; quite the opposite. It puts people on guard. It makes them suspicious and unwilling to do business with you. Better to build trust through a well-thought out, deliberate content marketing strategy based on internalizing what you learn from customers and the marketplace. It demonstrates that you understand the issues they face with your product and category, and enables you to respond with content – information, education, advice – that answers questions, resolves problems, offers advice and provides solutions that existing and potential customers consider relevant and valuable. Once your content marketing strategy solidly developed, you can easily decide which social tool to use for which message and how frequently to update whether the platform be Facebook, Twitter or your and others’ blogs. You are able to maintain consistency of purpose and presence, able to build off of content created by others in your space – thereby enhancing your and their credibility – and able to do so indefinitely into the future. As a result of those meaningful social efforts, you are more likely to become a destination that existing and potential customers consider relevant, gravitate towards, and willingly spend money with over time. The alternative – superficial social interaction – guarantees that you operate in a lonely void, pushing endless messages about yourself that customers consistently shun and mark as spam. Wouldn’t it be better to make your social efforts meaningful? I completely agree with you about being "social" online. However, it is very hard with something like "flooring" to engage your followers, let alone GET those followers. I am a flooring store owner and have a website, facebook, twitter and linkedIn profile...but I can honestly say that it does nothing besides branding. I haven't gotten a single sales lead from social media. Any suggestions? Please keep me posted on your progress and thanks very much for your comment.